San José, capital of Costa Rica, is located in the Central Valley region with the Talamanca Mountain Range to the south and volcanoes to the north. It’s known for its metropoly pace, almost a third part of Costa Rica’s population lives there. Actually, there are lots of things to visit and do: cultural sites, mountain tourism, busy nightlife, concerts, great hotels and sport activities. 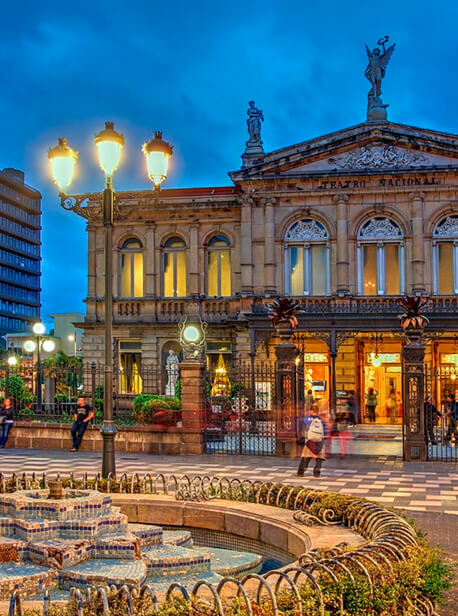 The city is distinguished by its Spanish colonial buildings, such as the decorated National Theater of Costa Rica, in neoclassical style, which overlooks the Plaza de la Cultura, a popular meeting point. Beneath the square, the Pre-Columbian Gold Museum displays hundreds of gleaming artifacts. The overflowing Mercado Central is filled with vendors and small restaurants (called “sodas”) serving local seafood, while the Mercado Nacional de Artesanías offers handmade products. In the Morazán Park, you will find the Temple of Music Pavilion, where concerts are held. The Parque Metropolitano La Sabana houses the national stadium and the Costa Rican Art Museum.